For a fresh taste of spring try my delicious Instant Pot Lemon Dill Salmon with fresh herbs. 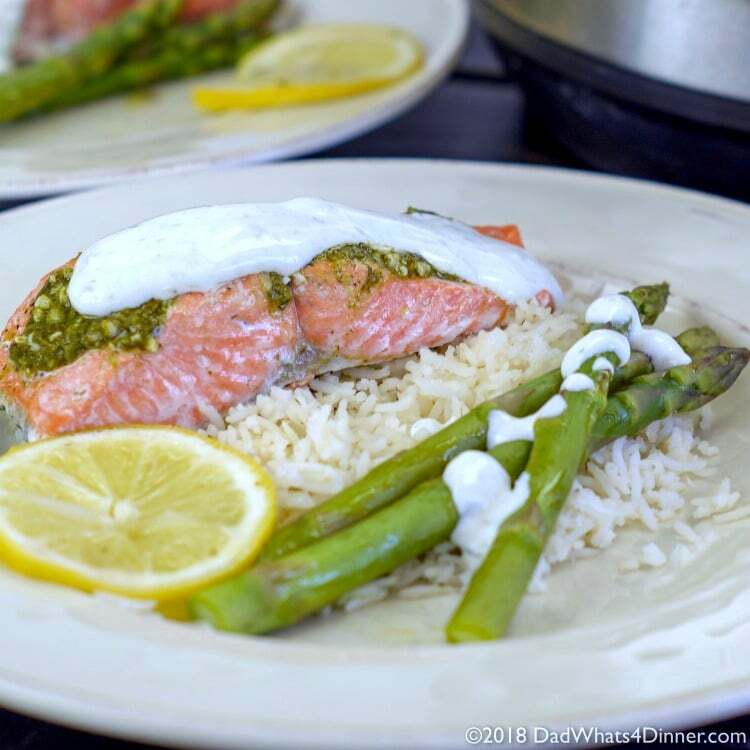 Cooked with asparagus and served with a creamy dill sauce it is the perfect dinner for a healthy weeknight meal. I started my new year’s resolution about a month and a half late but I am finally seeing some results and we are trying to eat healthy at all times. 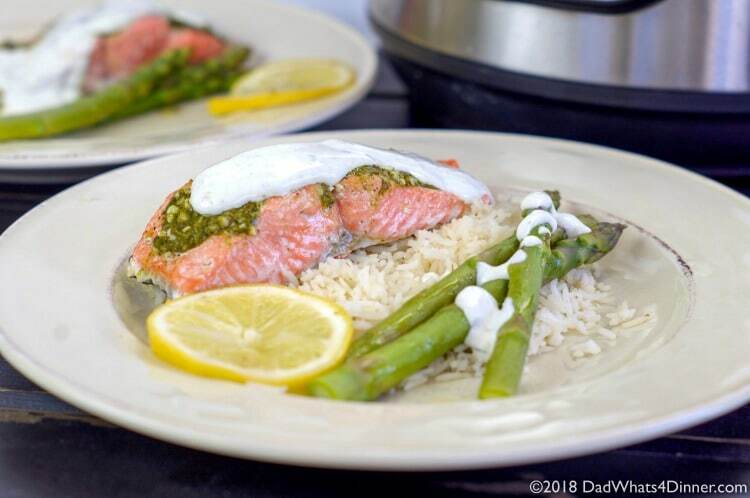 I love using fresh herbs and this recipe for Instant Pot Lemon Dill Salmon is a perfect example. The problem is fresh herbs are hard to find in the winter and unless I get the correct proportion snipped out of my garden in the summer I always seem to throw away the herbs before I use them all. 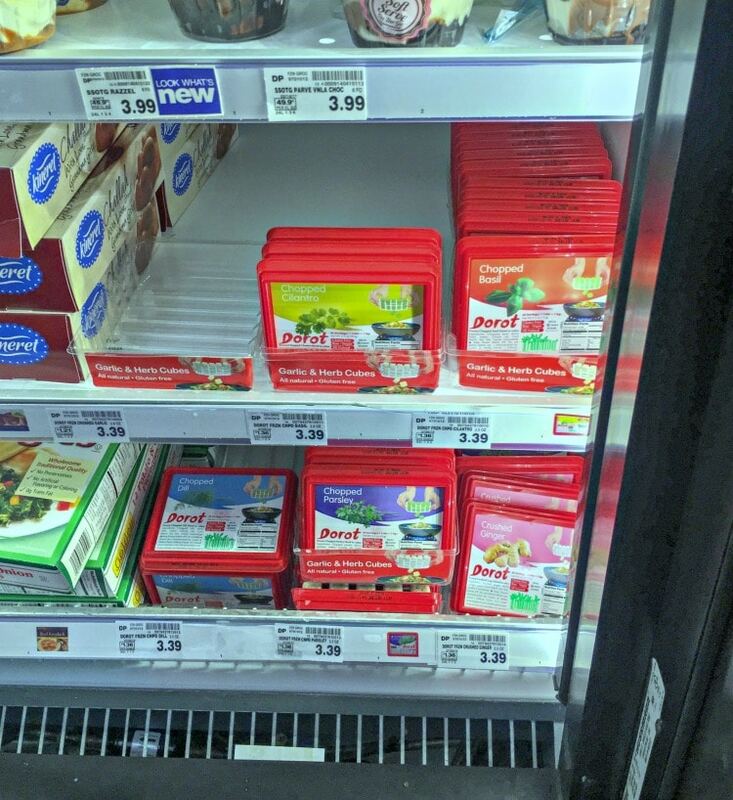 Well, I found a solution this week in the freezer section at my local Kroger. Yes, I said the freezer section! Dorot Gardens fresh frozen herbs were the answer to my winter herb woes. My Instant Pot Lemon Dill Salmon screams for fresh dill. Dorot Gardens provided the solution with perfectly proportioned herbs frozen at the peak of freshness. So I picked up my Instant Pot a few weeks after Christmas and have cooked with it at least three times a week. 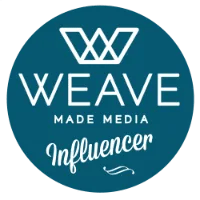 The Instant Pot is great for making healthy meals without all the fats and oils. 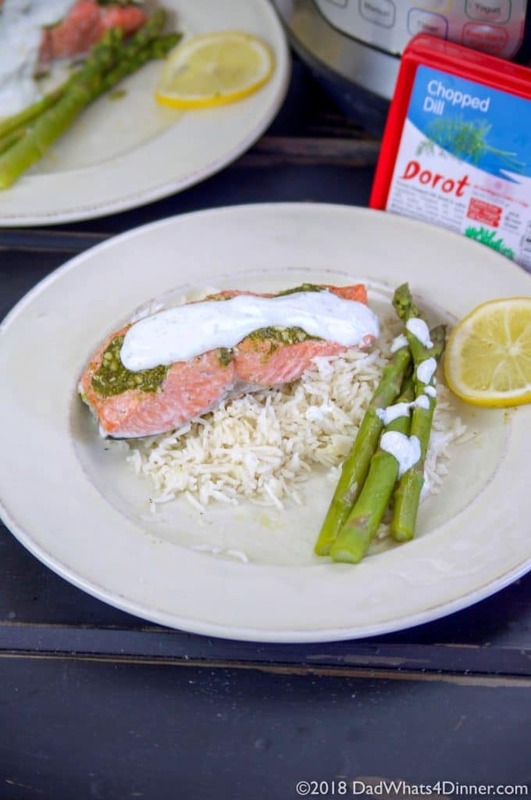 My Instant Pot Lemon Dill Salmon is my first time cooking fish in the IP and wow it was so easy and fast especially using the frozen fresh dill from Dorot Gardens. To make my Instant Pot Lemon Dill Salmon place the trivet in the Instant Pot and pour in chicken broth. Spray the trivet with cooking spray or place a piece of parchment paper on top of the trivet like I did. In a small bowl mix together three melted Dorot Gardens chopped dill cubes with butter, garlic and a dash of salt and pepper. Spoon mixture over salmon and place the fish skin side down on the trivet. Place a lemon slice on top of salmon. Add the asparagus to IP and put the lid on. Close the valve and select steam for 3 minutes. 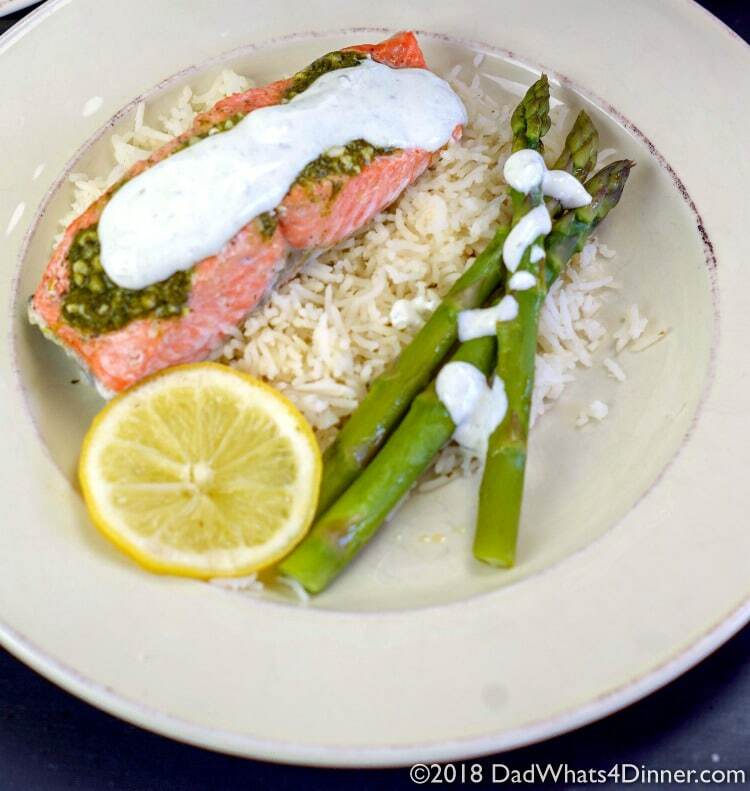 While salmon cooks make the creamy dill sauce by placing the yogurt in a small bowl. Add remaining Dorot Gardens chopped dill, lemon juice, salt, and pepper. Whisk together until creamy and thoroughly combined. Set aside. When IP beeps, release pressure using quick pressure release method. Do not allow natural release or the salmon and veggies will over-cook. To serve; first, remove the trivet then remove the salmon so it doesn’t fall apart. Place salmon over cooked rice with the asparagus and top with creamy dill sauce; serve immediately. Enjoy the healthy freshness all year-long. For a fresh taste of spring try my healthy and delicious Instant Pot Lemon Dill Salmon with fresh herbs. 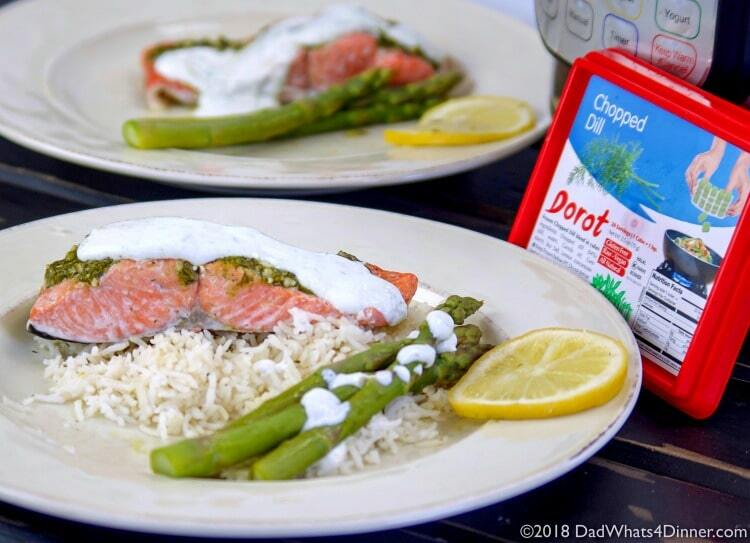 Cooked with asparagus and served with a zero point creamy dill sauce it is the perfect dinner for a healthy weeknight meal. Place trivet in Instant Pot and pour in chicken broth. Spray the trivet with cooking spray or place a piece of parchment paper on top. In a small bowl mix together three melted Dorot Gardens chopped dill cubes with butter, garlic and a dash of salt and pepper. Spoon dill mixture over salmon and place skin side down in the IP. Place a lemon slice on top of salmon. Add asparagus to IP and put the lid on. Close the valve and select steam for 3 minutes. While salmon cooks make the creamy dill sauce by placing the yogurt in a small bowl. Add remaining Dorot Gardens chopped dill, lemon juice, salt, and pepper. Whisk together until creamy and thoroughly combined. Set aside. When IP beeps, release pressure using quick pressure release method. Do not allow natural release or the salmon and veggies will overcook. To serve, remove the trivet then remove the salmon so it doesn't fall apart. 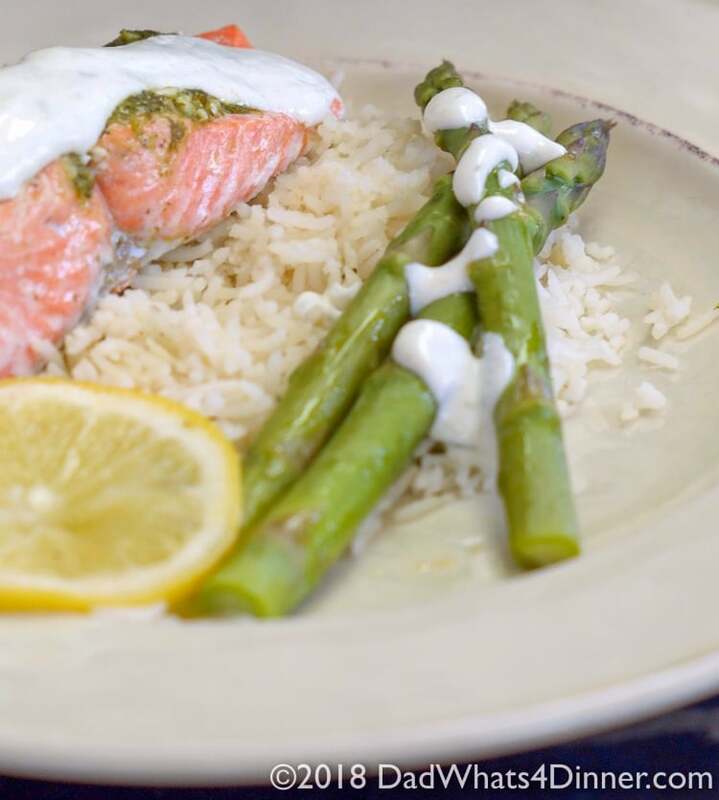 Place the salmon over cooked rice with asparagus and top with creamy dill sauce; serve immediately. Click here to find how you can enjoy fresh herbs during the winter and also get a $1 off coupon. 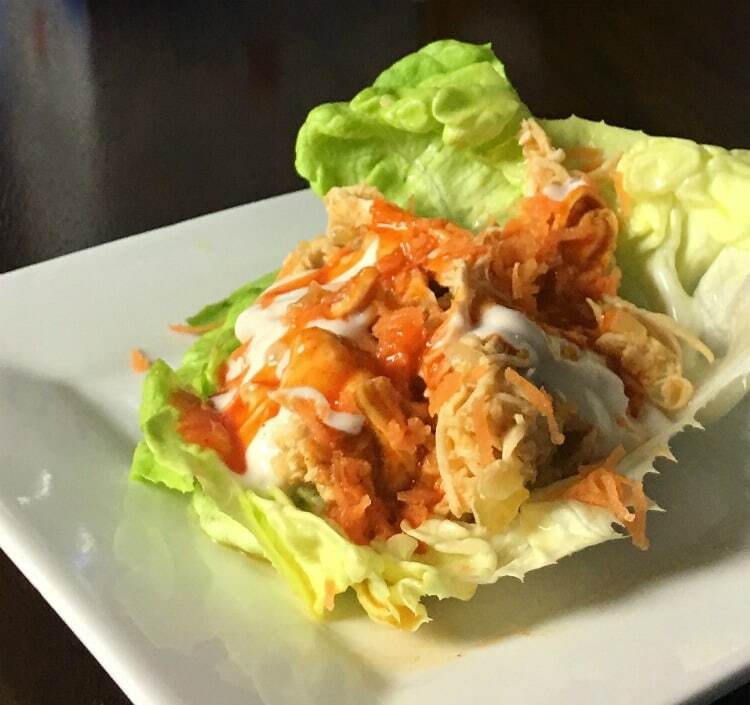 Check out more of our Instant Pot and healthy recipes! 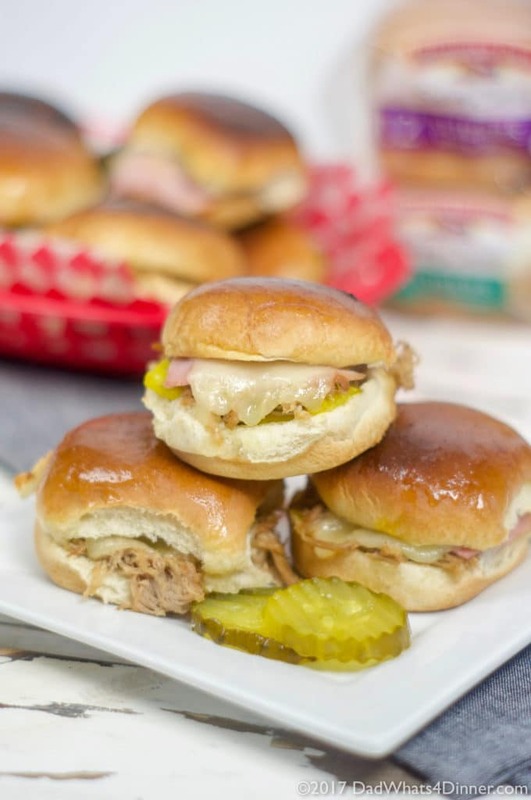 I STILL don’t have an instant pot, but I see great looking recipes like this and know I need one. This salmon looks absolutely great. Dorot cubes are such a neat concept. I always say that I’m going to freeze herbs to use later and then never do, so I love that these are just ready for you to use. And this sounds so good! It’s been way to long since I made salmon. I think I’m going to have to try this. The Dorot cubes are perfectly portioned and so fresh. Yeah, I say the same thing about my herbs but I never freeze them. Thanks for stopping by Tracy! Lemon and dill are two of my favorite flavors. This looks perfect for spring! They go perfectly with salmon. Thanks for stopping by! What can I say more than yum yum! Love salmon. Thanks for stopping by Jeanette. You said it YUM!